LADCO is an air quality research and planning organization located in Chicago. We work with state, local, and tribal (SLT) air agencies in the Great Lakes region to fulfill their commitments under federal clean air regulations to improve air quality in the region. Our member states include Illinois, Indiana, Michigan, Minnesota, Ohio, and Wisconsin. We are one of a group of six MJO’s (click map to expand). LADCO and the MJOs are funded primarily by U.S. EPA grants to the states under Section 105 of the Clean Air Act. 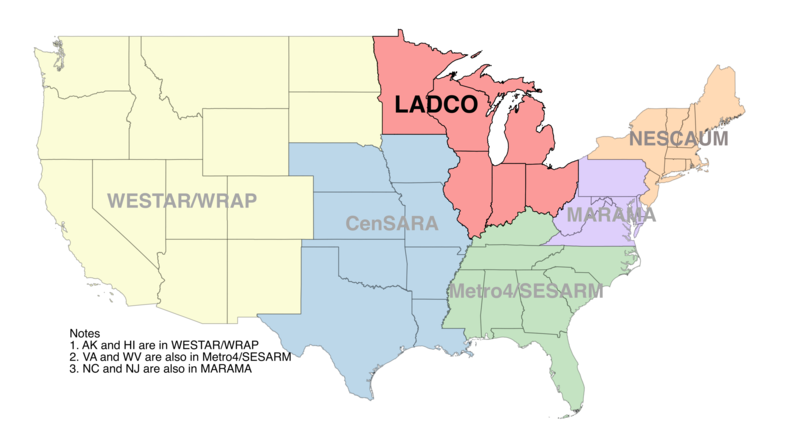 We serve as regional liaisons between the SLTs, U.S. EPA Regional Offices, and U.S. EPA national offices. Air pollution crosses political boundaries. The U.S. has a unique multi-scale approach to addressing air pollution. MJOs are part of an air quality management apparatus that includes municipal, state, regional, and national air planning agencies working together to tackle our air pollution problems. LADCO works in concert with the states in our region on technical issues to support their air quality planning goals. We coordinate on modeling, monitoring, data analysis, and training to address the common needs of the state air agencies in the region. The main purpose of LADCO is to provide technical assistance to our member states on problems of urban to regional-scale air quality. LADCO uses complex computer models of weather, emissions, and atmospheric chemistry to investigate the main drivers of air pollution in the Great Lakes region. We work with our member states to use the models for exploring air pollution control programs pursuant to their clean air goals. LADCO provides a forum for its member states to discuss and learn about technical and regulatory air quality issues. LADCO convenes regular meetings with our member states to discuss technical issues related to air quality planning. We also organize and facilitate training opportunities for the state air agency staff to build capacity for monitoring and controlling air pollution throughout the region. In addition to our work with our member states, LADCO partners with other MJOs and national air pollution research and planning agencies to coordinate on interstate air pollution transport, national training initiatives and data sharing. We work with stakeholders in the Great Lakes region to stay on top of the latest technical information on air quality planning and to understand LADCO’s role in the air quality regulatory process. LADCO’s major pollutants of concern are: ground-level ozone, fine particles, and regional haze and their precursors; however, problems related to other pollutants, such as mercury and air toxics, may be assessed at the direction of the member states. Our primary geographic focus is the area encompassed by our member states and any areas which affect air quality within these states.